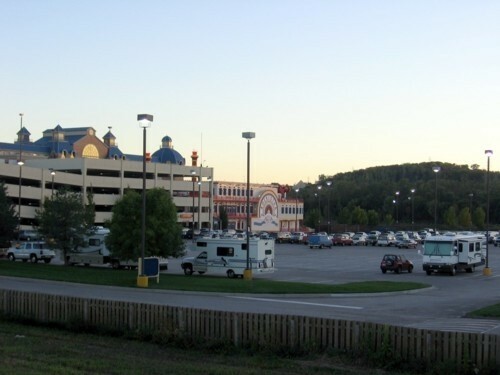 Designated RV Parking area located in the rear of the casino. Part of the parking lot. Free overnight parking. I didn't inquire about a length of stay limit. We're only staying tonight. Permission not required. No check-in (per person who answered the phone when I called the casino's phone number. There is a sign at the entrance and along the way that says "RV Parking-North lot" Park on north side of lot (which you will do if you follow the signs) Level paved lot. Lots of room for big rigs. Well lighted. Distant Interstate and occasional train noise. Security patrol. Easy walk to casino entrance. I saw parked shuttles but none running through this lot. There are very few cars or RVs at any of the town's four casinos tonight. There are four rigs parked here tonight. Community bike path/walking trail visible and accessible from the casino. I don't know anymore about it. No pool, showers or dump station. Didn't eat at the buffet ($16.99) Played a few games of video poker but we only play the 5 cent machines. All of their video poker machines are 25 cents. Maybe they'll bring in some 1 cent ones soon as there is a whole roomful of slot machines that have been stored unplugged. I assume that they've been replaced by 1 cent machines. Nothing for kids to do.